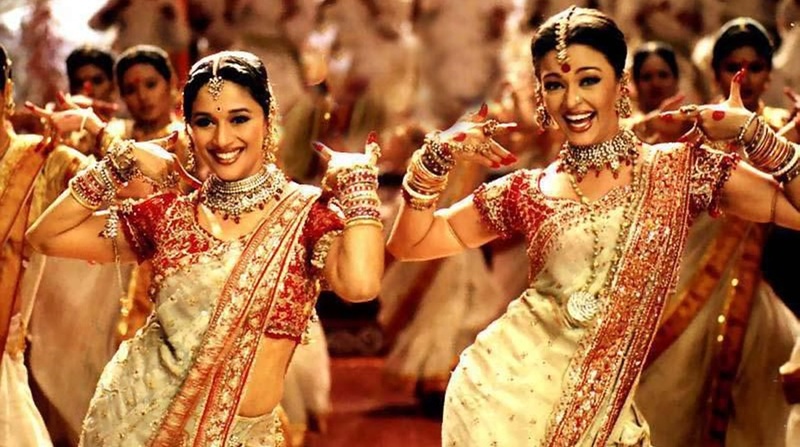 An Aishwarya Rai and Madhuri Dixit dance face-off from the 2002 box-office hit ‘Devdas’ has been voted the greatest Bollywood dance number of all time in a new UK poll. Remember the foot tapping song Dola re Dola from Shah Rukh Khan starrer Devdas? The dance that was performed by both Madhuri Dixit and Aishwarya Rai Bachchan is popular till date. The leading ladies performed in heavily embroidered ethnic outfits. An Aishwarya Rai and Madhuri Dixit dance face-off from the 2002 box-office hit ‘Devdas’ has been voted the greatest Bollywood dance number of all time in a new UK poll released on Friday. ‘Dola Re Dola’ from the Sanjay Leela Bhansali directed film, which was choreographed by Saroj Khan, beat tough competition from dance numbers across the decades to top a new list published by UK-based Eastern Eye’ newspaper. Pyar Kiya Toh Darna Kya’ from the 1960 classic Mughal-e-Azam’ came in at second place and another of Madhuri Dixit’s iconic routines, ‘Ek Do Teen”from the 1988 film ‘Tezaab’, came in third in the ’50 Greatest Bollywood Dance Numbers’ list, collated based on public votes, cinematic impact, choreography, staging and opinions of dance experts. Hrithik Roshan’s Ek Pal Ka Jeena’ from the film Kaho Naa Pyaar Hai’ was voted fourth and the legendary Vyjayanthimala song Hothon Pe Aisi Baat’ from ‘Jewel Thief’ completed the top five. The rest of the top 10 was made up of Kamli’ from Dhoom 3′ (6), Piya Tu Ab To Aaja’ from Caravan’ (7), Choli Ke Peeche’ from Khalnayak’ (8), Chhaiya Chhaiya’ from Dil Se’ (9) and Mehbooba Mehbooba’ from Sholay’ (10). “The sheer variety in the list shows that Bollywood hasn’t just led the world with musicals, but with dance also. There is everything from Indian classical to western contemporary to out of the box ideas like a dance on top of a train. The list also shows how much dance has been used as a form of expression and liberation,” said Nazir. Some of the other well-known dance numbers on the list include Inhi Logon Ne’ from Pakeezah’ (12), Sheila Ki Jawani’ from Tees Maar Khan’ (14), O Haseena Zulfon Waali’ from Teesri Manzil’ (16), Kajra Re’ from Bunty Aur Babli’ (18), Nimbooda Nimbooda’ from Hum Dil De Chuke Sanam’ (23) and Munni Badnaam Hui’ from Dabangg’ (25).